HOOVER – In what could be the final time SEC Football Media Days is held at the Wynfrey Hotel in Hoover, the Auburn Tigers, Ole Miss Rebels and South Carolina Gamecocks gathered on Thursday to share what each is hoping to accomplish in the new football season. Auburn is trying to end Alabama’s reign as the best in the West Division, while Ole Miss is trying to keep its head above water, uncertain of its immediate future. South Carolina is optimistic in the second year of the Will Muschamp era. After 17 years at the Wynfrey, the SEC is considering relocation. Possible future locations could be Atlanta, Dallas and Nashville. 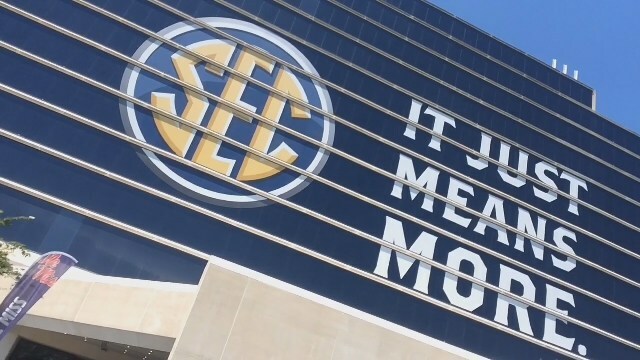 The SEC and the Wynfrey have been going on a yearly contract for the annual summertime gathering of the 14 schools and 1,000 members of the media. Auburn is hoping to be a serious contender against Alabama in the SEC West this season, after the Tigers made strides in 2016. But losses to Georgia and then to Alabama, knocked Auburn out of title game contention last season. They were able to get a good invitation, heading to the Sugar Bowl in the new Year's Six segment, playing Oklahoma. Gus Malzahn is in his fifth season on the Plains. He has experience at quarterback with Sean White, but White has gone through a period of not staying healthy. What helped the Tigers was getting former Baylor QB Jarrett Stidham, who moved ahead of White for the starting position in the spring. The Tigers have returning experience in the backfield with starter Kamryn Pettway and reserve Kerryon Johnson. Ryan Davis and Darius Slayton are back at wide receiver. Three starters are in the offensive line with center Austin Golson and tackles Braden Smith and Darius James. Seven is the number for defensive starters. Tray Matthews is one of three key people in the secondary, with Stephen Roberts and Carlton Davis. The line has Dontavius Russell and Marlon Davidson while linebacker experience features Deshaun Davis and Darrell Williams. "I'm proud of how our team overcame adversity last year after we didn't start well," Malzahn said. "We had a six-game winning streak, but we didn't seize the moment. Injuries have hurt us the last two years. This team is hungry and has something to prove. That last time I felt that here was in 2013. "We have depth at the quarterback position. Jarrett Stidham has been trying to win over his teammates, Sean White is healthy. The exciting thing for me is we have depth there. "Jarrett is a better athlete than many people know. You have to have a quarterback that can escape pressure, know when to run it and to throw it. I like the way he reacted against our defense in the spring." When asked about trying to take Alabama out of the top of the SEC West and thoughts of Auburn being realigned to the East Division, Malzahn said, "The West Division is the best league in college football. It's a man's league. Alabama is at the top. They play at a high level. Our goal is to win the SEC. In order to do that, you have to beat Alabama. The last two times we did, we won the SEC. Getting them at home this year is a positive. "The talk about us moving to the East was blown out of proportion. We like playing Alabama, LSU, Ole Miss, Mississippi State, Texas A&M and Arkansas each year. "We were not happy with the way we finished last season. We have the most experience this team has had in 12 years. We have a chip on our shoulder." Things could have not gone any worse for Ole Miss before coming to Media Days. The dark cloud got darker on Wednesday when former coach Houston Nutt filed a defamation lawsuit against the school. Among the defendants named is current head coach Hugh Freeze. Ole Miss is already being investigated for potential wrongdoing by the NCAA. As a penalty, the Rebels opted to not be bowl eligible for 2017. Now, there’s more damage with uncertainty hanging over the future of Freeze and others, too. Freeze was disappointed in the timing of the lawsuit from Nutt and his attorney. He stated, "I can't comment on it, for it being in the legal system. Our team will handle it the right way." Freeze spoke about talking more on other items than about his football team the five years he has been at Ole Miss. "We have been responsible in the things we've done." Despite the infractions, Freeze feels the team is doing well in recruiting. "People who know me for who I am, I don't have to explain it. We will continue to be responsible." Freeze said that when coming to Hoover via university plane with his players, QB Shea Patterson, OL Javon Patterson and DT Breeland Speaks, they didn't have a clue about the lawsuit that was filed against the school Wednesday. "The players' greatest testimony to me is not a single one has checked out on us. We don't want so much drama attached to it. I don't want to experience this again." Ole Miss has five starters back on offense, with Patterson eager to get more snaps after playing in three games in 2016. He performed very well in a huge 29-28 victory at Texas A&M on Nov. 12. The defense returns six to the starting group, featuring Speaks at defensive tackle. "We have to develop leadership. We are good on offense, but we have young kids at linebacker and in the secondary. "This is the opportunity to have one of our finest hours here," Freeze said in regard to the Rebels imposing a bowl ban for 2017. "We are embracing it as a challenge." Sept. 2 – South Alabama, Sept. 9 – UT Martin, Sept. 16 – at California, Sept. 30 – at Alabama, Oct. 7 – at Auburn, Oct. 14 – Vanderbilt, Oct. 21 – LSU, Oct. 28 – Arkansas, Nov. 4 – at Kentucky, Nov. 11 – UL Lafayette, Nov. 18 – Texas A&M, Nov. 25 – at Mississippi State. Muschamp looks at 2017 as an opportunity to be much better, especially with 10 offensive starters coming back. Sophomore QB Jake Bentley showed progress starting the last seven games of 2016 with Carolina posting four victories. Running back Rico Dowdle, along with wide receivers Deebo Samuel and Bryan Edwards, and tight ends Hayden Hurst and K.C. Crosby, give the Gamecocks experience in the skill positions behind Bentley. Center Alan Knott, guard Cory Helms, tackles Malik Young and Zack Bailey complete the experienced personnel Carolina believes can see better results this fall. Defensive tackles Taylor Stallworth and Ulric Jones, linebacker Bryson Allen-Williams, cornerbacks Jamarcus King and Chris Lammons and safety D.J. Smith are seasoned starters. "We are still a very young football team," Muschamp remarked. "We have only 11 seniors. Seventy percent of our team is made up of freshmen and sophomores. "Offensively, we see competition. We have that in multiple positions. We have depth at wide receiver. We have recruited very well. We had made a lot of improvement in the offensive line. "We have a lot of unknowns on defense. Our 11th practice in the fall will be a scrimmage. We will find out a lot on where our defense is at that time. We need to play well defensively to take the next step. Going from year one to year two is a large movement as far as improvement. "The players have bought into the cult. I feel we are on the verge of really good times here." Sept. 2 – North Carolina State (Charlotte), Sept. 9 – at Missouri, Sept. 16 – Kentucky, Sept. 23 – Louisiana Tech, Sept. 30 – at Texas A&M, Oct. 7 – Arkansas, Oct. 14 – at Tennessee, Oct. 28 – Vanderbilt, Nov. 4 – at Georgia, Nov. 11 – Florida, Nov. 18 – Wofford, Nov. 25 – Clemson. Predictions, final analysis will be posted on Friday.